The Domaine des Chers' house dates from the XVIIIth century. 1956 Henri Briday, wine merchant, buys the vineyard located in the place called « les chers », just next to the « Mouilles ». This bright purchase allows great wines production thanks to excellent terroir resources and location. Henri names the vineyard « Domaine des Chers ». 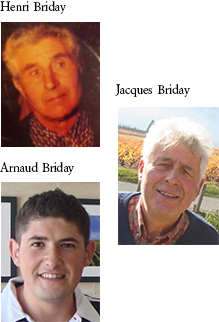 1986 Jacques Briday (Henri's son), determined to continue his father's work, launches the « Old Vines » vintage, refering to the significant vines age (40 to 100 years). The direct consequence is that it gives smaller quantity but higher quality. From now on, the major part of his production is sold directly to the customers at the vineyard. 2006 « My father's secret » is launched by Jacques and his son Arnaud. This vintage is made with 90 years old vines and is limited to a 2 800 bottles production. Powerful and fruity, it's very atypical since it is turned to wine by a very particular way. It shows the great potential of our grape variety . 2007 In order to create his own first property, Arnaud buys 1,2 hectars of Saint Amour. 2009 The entire vineyard is inherited by Arnaud. After 8 years wine studies from Mâcon to Paris, his wish is to keep his father's legacy, combining modern and traditional ways of working. Making high quality wines is his goal.